played by one of Swing Music's greatest drummers*. with its the traditional triangle tip and taper. Versatile, perfect for the Jazz trio up to big band. Relive the 40's with sticks that helped define the music. *The initals "GK" might give a you a hint. 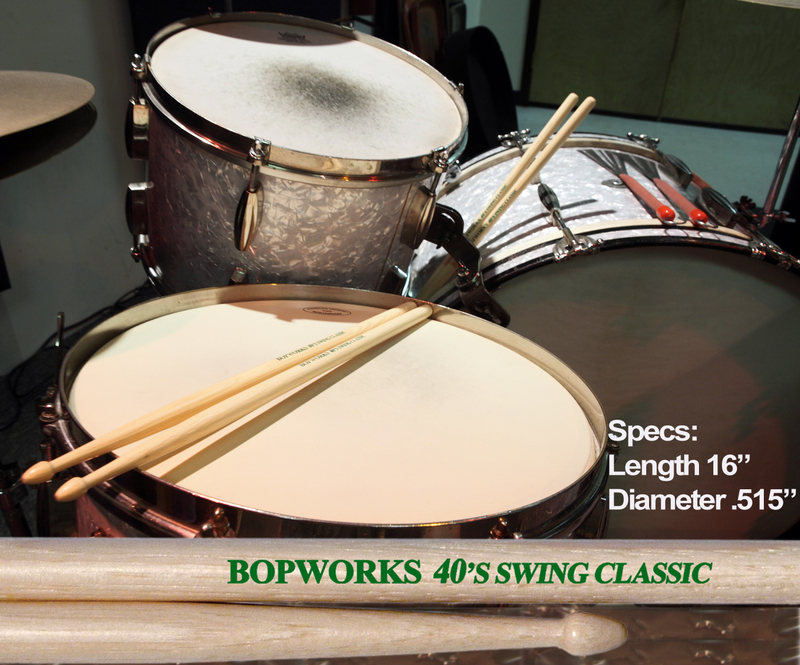 I have used the standard American Classic 5A sticks for many years, but playing with Bopworks 40's Swing Classic is what feels like I am truly stepping into vintage classic drumming and playing to Benny Goodman as well as Topper Headon's Clash songs. Great drumsticks, the sound is well defined for the cymbals and the drums. I thought they balanced well with the drum set and the style of music that we play(1940s Big Band). I have tried various other sticks including models marketed at big band models these sticks are great. They can be soft or loud. Will be trying more products from Bopworks. Highly recommend to give them a try. Long, lean, balanced, and that bead sounds incredible on my handhammered Turkish cymbals. Beatiful sticks from Bopworks--I'm a Bopworks fanboy. Great stuff. May become my new favorite! Very nice light stick for jazz including big band, also rock if you're not a heavy hitter. Acorn tip gives great cymbal and bell-of-cymbal sounds. Similar to VF Tommy Igoe model but a touch lighter and better cymbal sounds. Finish is beautiful! The 40s Swing Classic model sticks are an instant favorite and my new go-to stick for acoustic jazz and eclectic music styles that require a varied touch-- especially lower-volume situations where I want a really clean, crisp, lighter touch on the cymbals. Since I no longer play heavy/loud music, I don't need big logs anymore anyway. A notable characteristic is the silky finish or varnish, not too slick or slippery, but a very smooth/perfectly sanded surface feel to grab onto without much slippage. I was using the Shelly Manne model for playing in low volume settings but since that model was discontinued, I thought I would give the 40's Swing Classic a try. To my surprise, I like them even better than the Shelly's. They are very light like the Shellys, but the extra length gives them a better feel/balance, as well as greater ease getting around the kit. They sound great on cymbals. I will definitely be going back for more. Also, the service at Bopworks is superb! Able to withstand abuse from playing heavier styles while still feeling light enough for more delicate pieces. Best of all is the tone that I'm able to pull out of my drums and cymbals with these sticks, they sound amazing! I like the classic 40's for their length (long) and width (small). I play hard rock to brushes, and these lightweight sticks allow me to control my dynamics over a broader range. The longer sticks make it easy to go around the toms while maintaining balance for double bass work. Sticks are a little slippery, but nothing a little sandpaper cannot take care of. I am trying to find a historical drummer who played with 17" sticks in the hope that you would make a pair :) Very pleased, with product & customer service !